Intraoperative enteroscopy is an accurate method for examination of the entire small bowel. It may be carried out with a standard or thin-caliber colonoscope or with a push or sonde enteroscope. 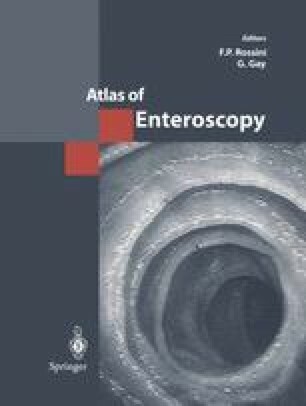 The advent of the modern push videoenteroscopes has brought about considerable improvement in terms of reducing trauma to the mucosa, improving endoscopic vision, reaching more distal segments of the small bowel, as well as making all therapeutic procedures possible. Exploration of the small bowel by both direct vision and palpation, or only laparoscopically, should be accomplished before the scope is introduced into the small bowel. This procedure can diagnose tumors, large vascular lesions, and Meckel’s diverticulum. The finding of such lesions will obviate the need for intraoperative enteroscopy. The endoscope is mainly inserted orally and by enterotomy.